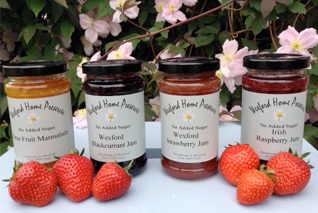 Wexford Home Preserves is a family-run business based in New Ross, Co. Wexford. Tom and Laura Sinnott took over the running of the business from Tom’s Aunt Eileen who had been making artisan jam since 1988 and have continued the tradition of making top quality, award winning, jams marmalades and savoury preserves. The company uses traditional recipes handed down through the generations and pride themselves on working with the best of local ingredients and suppliers. Wexford Home Preserves have consistently achieved recognition for the quality of their product and this quality has been rewarded by inclusion in the Dunnes Stores Simply Better range as well as a presence in over 350 shops nationwide. Tom and Laura felt, however, that there was further potential to diversify the product offering and target market segments to allow for further growth into the future. Presented with this untapped potential, the company needed to decide which direction they wanted to take and make definite strategic decisions for their business to strive forward and expand. The team at RIKON visited the premises to see first-hand the artisan production technique. It subsequently engaged in a series of workshops with the company where, through brainstorming and detailed examination of the business model, a roadmap was devised for the future strategy of the business. The agility of the company’s production process was identified as a core strength allowing new product development in line with market preferences. This agility was focused upon to allow for diversification, in particular into previously unexplored market segments, new retail segments and a focus on the export market. “The team at RIKON helped us to focus on new business strategies and provided insights into untapped areas of the market that offer vast opportunities for Wexford Home Preserves. After working with Mary Clare and Vladislavs we now have a clear strategy to follow which we have already started to work on and put in place”.